Late last year, the Auvergne-Rhone-Alpes regional government in France announced it would contribute €35 million to the Nano 2022 project, an initiative to advance microelectronics. Among the recipients of the funding are Sofradir and its subsidiary Ulis, which are themselves investing €150 million in the programme with the aim to develop the next generations of infrared detectors. David Billon-Lanfrey, director of strategy at Sofradir, said the company could potentially improve the performance of infrared sensors by up to 30 per cent when the project concludes in 2022. The Nano 2022 project involves research and development in applications for automotive, IOT, space, avionics and security. 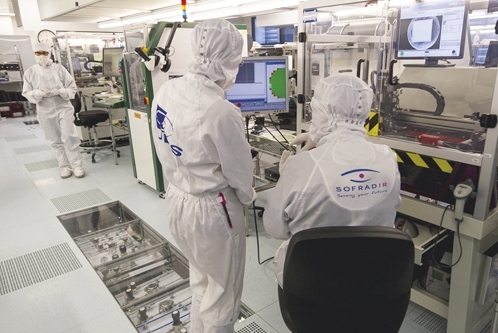 It will help fund new microelectronics pilot lines for all semiconductor fabrication, not just infrared technology, with STMicroelectronics and Soitec addressing silicon semiconductor applications. It is part of a wider European Commission-financed project, involving France, Germany, Italy and the UK, to give €1.75 billion up until 2024 in public support for research and innovation in microelectronics. Sofradir is working on two aspects of its infrared detectors. Firstly, it aims to reduce the pixel pitch on the focal plane arrays (FPAs), which means more pixels can be fitted on a die to reach higher resolution. Alternatively, the FPAs can be made smaller and lower cost with smaller pixels. The second part of Sofradir’s R&D work is to increase the operating temperature of cooled FPAs, which at the moment have to be cooled to -200°C to minimise noise in the image. ‘To be in a position to increase the number of applications and have the detectors inside compact cameras and systems, we need to reduce the power consumption of these detectors, along with their size and cost, which can all be addressed through improving the focal plane array operating temperature,’ Billon-Lanfrey said. For its part in the Nano 2022 project, Sofradir will focus on high-end applications in surveillance, defence and astronomy. One part of Sofradir’s plans is to develop very large FPAs that will fit Extremely Large Telescopes – the company is targeting 2,000 x 2,000 pixels in an FPA for this type of application. Here, the priority is to satisfy extremely high performance requirements on very large sensors and develop the manufacturing capability to build these large FPAs, according to Patrick Abraham, public and private partnership manager at Sofradir. Another area that new infrared detectors could open up is integration onboard drones, largely thanks to the ability to run the detectors at a higher operating temperature. By not having to cool the detectors to -200°C, sensors will be more compact and consume less power, both of which will make infrared imaging from drones more feasible. ‘Right now it’s difficult to get infrared sensors onboard drones, because of the weight and autonomy reduction it produces,’ Abraham said. He added there are many applications that would benefit from infrared vision on drones, such as monitoring industrial plants and gas detection. Ulis, Sofradir’s subsidiary, will use the Nano 2022 funding to target higher volume markets for its microbolometers. These include applications such as people counting in buildings, along with advanced driver assistance systems, adding infrared imaging capabilities to the visible and radar sensors already used in cars – today, infrared imaging is only available on high-end vehicles. ‘These new [Nano 2022] pilot lines will allow us to assess these large volume applications at an affordable price,’ noted Billon-Lanfrey. The project runs until 2022, although some technology and products will take longer than others, according to Abraham – the very large components for space applications have a very stringent and longer qualification time, he said. 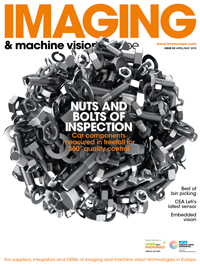 Among the latest infrared camera releases is Automation Technology’s smart IRSX series. Designed as an all-in-one solution, the IRSX cameras combine a calibrated thermal imaging sensor with a data processing unit and a variety of industrial interfaces in a small, rugged IP67 housing. The series includes GigE Vision, Modbus TCP, HTTPS, and FTP protocols for communication with external automation and control equipment, while APIs such as REST, GigE Vision, MQTT, and OPC-UA are supported by software tools. The IRSX series comprises a variety of models with different fields of view, resolutions and frame rates, and covers a broad spectrum of applications in industrial process automation requiring thermal monitoring. The cameras are available from Stemmer Imaging. Raptor Photonics has launched a low-noise VIS-SWIR camera. Using a 640 x 512-pixel InGaAs sensor, and stabilised to 15°C, the Night Owl 640 offers visible extension from 0.4µm to 1.7µm. The camera offers less than 18 electrons readout noise and an intrascene dynamic range of 56dB, enabling simultaneous capture of bright and dark portions of a scene. The Night Owl 640 runs at 120Hz and is available with a 14-bit Camera Link output. It features on-board automated gain control and a three point non-uniform correction algorithm for high-quality images. Flir Systems has released three Neutrino midwave infrared camera cores. The Neutrino LC is the smallest, lightest weight, and lowest power-consuming Neutrino model available, and is therefore ideal for integration onboard drones. The Neutrino SX12 produces high-definition thermal imaging video, while Neutrino QX, with 3.1 megapixels, is Flir’s highest resolution MWIR core.